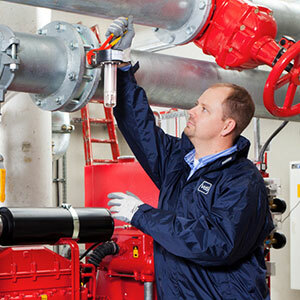 VdS Inspection Services, is Europe’s leading expert organization for fire safety. Its experts assess more than 21.000 fire safety systems worldwide every year. This number is rising regularly with new systems that are tested at regular intervals after initial testing. The basis for testing are VdS guidelines, which frequently go beyond the legal regulations and thus offer optimum fire protection. Over and above this, national and international standards are used for testing, for example the US NFPA regulations (National Fire Protection Association) and FM (Factory Mutual). The VdS range of services also covers testing based on insurance requirements and regulations from building authorities as well as testing of fire protection facilities under building legislation. A clear focus on fire safety in combination with its own laboratories allows VdS to make excellent “full-package” offers that are unique selling points on the competitive market. The VdS approval mark creates orientation and confidence and documents the high quality and reliability of products and services. 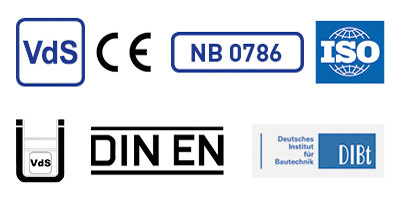 VdS also approves CE conformity, issues the EC conformity certificate for construction products and certifies conformity according to national and international standards (EN, IEC, ISO, etc.). Save costs and effort by getting all certificates from one institute: VdS.